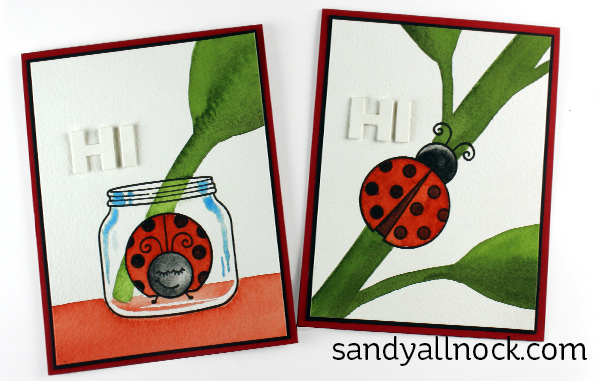 Did you ever catch bugs as a child, and keep them in little jars? I remember doing that – fireflies, ladybugs….we’d poke holes in the lids, tuck leaves in and add a few drops of water in hopes of keeping the little creatures alive. Alas, I eventually learned that these critters were never meant to live in jars! 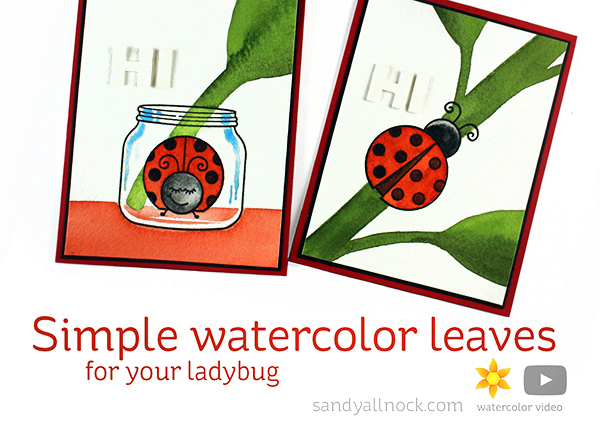 But – with stamps, I can return to the joy of watching a ladybug crawl along a leaf – but by painting it! Watch the video to see some simple tips to create graphic leaves to feed your Honey Bee Little Ladies! Watch the video below or click HERE to see it in HD on YouTube. You could make endless cards with these little buggies….so many diffferent leaves and angles. Add a light blue wash for a sky background before painting the leaves and change it up even more! So cute, it’s their smiled that make me laugh the most, I’m going to really look at the next one I see in the garden to see if it’s smiling too. Great set of happy cards so nicely done as always from you. According to Pixar, A Bugs Life. ladybird can be male or female, there’s a little scene where he explains because other hugs were calling him she. Very funny ! These are just fantastic ! Yes I collected ladybugs and other fun bugs when I was a kid.. Awesome cards and love the leaves you created. Great scenes for those cute precious ladybugs. The Hi was perfect. They are so cute Sandy, thanks for this lovely cards and for showing how to make beautiful stems and leaves. Cute cards. I love watching you watercolor and create your own scenes around your stamped image. Love watching your videos. These make me smile. So cute. 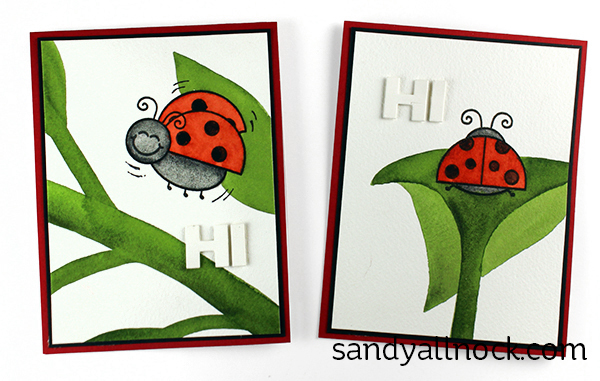 Sweet stamp set, very clever cards – love the BIG leaves! Great idea to get those of us who are still lacking confidence with watercolors to do a fun project… Or just fun for everyone. Thank You!